A Christmas tree is one of the most popular traditions associated with the celebration of Christmas. It is normally an evergreen conifer that is brought into a home or used in the open, and is decorated with lights and colorful ornaments during the days around Christmas. Although sometimes referenced as having pagan roots and occasionally renamed as a "holiday tree," the Christmas tree has long been tied to the Christian religion and is viewed by many as part of a spiritual tradition. Dionysus in his Triumphant Return; behind the god, Victoria holds an evergreen. The Christmas tree is often explained as a Christianization of the ancient pagan idea that the evergreen tree represents a celebration of the renewal of life. Roman mosaics, from what is today Tunisia, show the mythic triumphant return from India of the Greek god of wine and male fertility, Dionysus (dubbed by some modern scholars as a life-death-rebirth deity), carrying a tapering, coniferous tree. Medieval legends, nevertheless, tended to concentrate more on the miraculous "flowering" of trees at Christmas time. A branch of flowering Glastonbury thorn is still sent annually for the Queen's Christmas table in the United Kingdom. Patron trees (for example, the Irminsul, Thor's Oak, and the figurative Yggdrasil) held special significance for the ancient Germanic tribes, appearing throughout historic accounts as sacred symbols and objects. Among early Germanic tribes, the Yule tradition was celebrated by sacrificing male animals and slaves by suspending them on the branches of trees. According to Adam of Bremen, in Scandinavia the pagan kings sacrificed nine males of each species at the sacred groves every ninth year. According to one legend, Saint Boniface attempted to introduce the idea of trinity to the pagan tribes using the cone-shaped evergreen trees because of their triangular appearance. The modern custom of Christmas trees, however, although likely related, cannot be proven to be directly descended from pagan tradition. It can be traced to sixteenth century Germany. Ingeborg Weber-Keller, Marburg professor of European ethnology, identified as the earliest reference a Bremen guild chronicle of 1570 that reports how a small fir was decorated with apples, nuts, dates, pretzels and paper flowers, and erected in the guild-house for the benefit of the guild members' children, who collected the dainties on Christmas day. Another early reference is from Basel, where the tailor apprentices carried around town a tree decorated with apples and cheese in 1597. The city of Riga, Latvia claims to be home of the first holiday tree. An octagonal plaque in the town square reads "The First New Years Tree in Riga in 1510," in eight different languages. During the seventeenth century, the custom entered family homes. One Strasbourg priest, Johann Konrad Dannerhauer, complains about the custom as distracting from the word of God. By the early eighteenth century, the custom had become common in towns of the upper Rhineland, but it had not yet spread to rural areas. Wax candles are attested from the late eighteenth century. The Christmas tree remained confined to the upper Rhineland for a relatively long time. It was regarded as a Protestant custom by the Catholic majority along the lower Rhine, and was spread there only by Prussian officials, who were moved there in the wake of the Congress of Vienna in 1815. In the early nineteenth century, the custom became popular among the nobility and spread to royal courts as far as Russia. Princess Henrietta von Nassau-Weilburg introduced the Christmas tree to Vienna in 1816, and the custom spread across Austria in the following years. In France, the first Christmas tree was introduced in 1840 by the Duchess of Orleans. In Britain, the Christmas tree was introduced by King George III's German Queen Charlotte of Mecklenburg-Strelitz, but did not spread much beyond the royal family. Queen Victoria as a child was familiar with the custom. In her journal for Christmas Eve 1832, the delighted 13-year-old Princess wrote: "After dinner...we then went into the drawing-room near the dining-room...There were two large round tables on which were placed two trees hung with lights and sugar ornaments. All the presents being placed round the trees..." After her marriage to her German cousin, Prince Albert, the custom became even more widespread. In 1847, Prince Albert wrote: "I must now seek in the children an echo of what Ernest [his brother] and I were in the old time, of what we felt and thought; and their delight in the Christmas-trees is not less than ours used to be." The generous Prince Albert also presented large numbers of trees to schools and army barracks at Christmas. Images of the royal family with their Christmas tree at Osborne House were illustrated in English magazines, initially as a woodcut in the Illustrated London News of December 1848, and copied in the United States at Christmas 1850 (illustration, left). Such patriotic prints of the British royal family at Christmas celebrations helped popularize the Christmas tree in Britain and among the anglophile American upper class. There are several cities in the United States that lay claim to that country's first Christmas tree. Windsor Locks, Connecticut claims that a Hessian soldier put up a Christmas tree in 1777 while imprisoned at the Noden-Reed House, thus making it the home of the first Christmas tree in New England. The "First Christmas Tree in America" is also claimed by Easton, Pennsylvania, where German settlers reportedly erected a Christmas tree in 1816. However, it has also been said that German immigrants were displaying Christmas trees as early as the 1740's in Pennsylvania. Many cities, towns, and department stores put up public Christmas trees outdoors for everyone to enjoy, such as the Rich's Great Tree in Atlanta, Georgia; the Rockefeller Center Christmas Tree in New York City; and the large Christmas tree at Victoria Square in Adelaide. During the 1970s and 1980s, the largest Christmas tree in the world was put up every year on the property of the National Enquirer in Lantana, Florida. This tradition grew into one of the most spectacular and celebrated events in the history of south Florida. This annual affair was discontinued upon the death of the papers founder in the late 1980s. 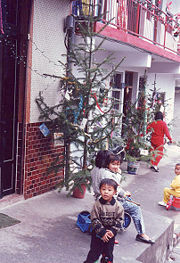 In some cities, festivals are organized around the decoration and display of multiple trees as charity events. In some cases, the trees represent special commemorative gifts, such as in Trafalgar Square in London where the City of Oslo presents a tree to the people of London as a token of appreciation for the British support of Norwegian resistance during the Second World War; in Boston, where the tree is a gift from the city of Halifax, Nova Scotia, in thanks for rapid deployment of supplies and rescuers to the 1917 ammunition ship explosion that leveled Halifax harbor; and in Newcastle upon Tyne, where the 15 meter tall main civic Christmas tree is an annual gift from the city of Bergen, Norway in thanks for the part played by soldiers from Newcastle in liberating Bergen from Nazi occupation. National Christmas Tree in Washington, D.C. The United States' National Christmas Tree is lit each year south of the White House in Washington, D.C. as part of what has become a major holiday event. In 1979, President Jimmy Carter only lit the crowning star atop the Tree in honor of the Americans being held hostage in Iran; in 1980, the tree was only fully lit for 417 seconds, one second for each day the hostages had been in captivity. The term Charlie Brown Christmas tree can be used to describe any sad-looking, malformed little tree. Some tree buyers intentionally adopt such trees, feeling sympathetic to their plights. The term comes from the appearance of Charlie Brown's Christmas tree in the classic TV special A Charlie Brown Christmas created by cartoonist Charles Schultz. Most Christmas trees are firs, pines, and spruces, although other types of trees are also used. The most popular Christmas tree species in the United States generally are Scotch Pine, Pinus sylvestris, Douglas Fir, Pseudotsuga menziesii, Fraser Fir, Abies fraseri, Balsam Fir, Abies balsamea, and Blue Spruce, Picea pungens. The Eastern Red Cedar is popular in the southern United States. In the early twentieth century, the artificial tree, particularly the Goose Feather Tree, became popular. These were originally invented in the 1880s in Germany to help prevent some of the damage being done to fir trees when people cut off their tops for Christmas trees. In the 1930s, the Addis Brush Company created the first artificial-brush trees, using the same machinery that made their toilet brushes. These had an advantage over the feather tree in that they would take heavier decorations. The Addis "Silver Pine" tree was patented in 1950. It was designed to have a revolving light source under it; colored gels allowed the light to shine in different shades as it revolved under the tree. In the 1980s and 90s, more realistic artificial trees were created and have become very popular. In 2002, 70 percent of Christmas trees in American homes were artificial. The advantages of artificial trees include lower cost, since the tree can be reused for several years, and less mess and potential allergy and fire hazards than a real tree. 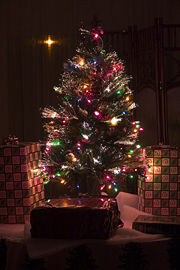 Artificial trees have been criticized for not being recyclable. After a few years of use, most are thrown out and end up in a landfill, whereas natural trees can be recycled into mulch or used in various environmental projects, such as protection of dunes and marshlands and improvement of fish habitats. Tinsel and several types of garland or ribbon are commonly used to decorate a Christmas tree. Delicate mold-blown and painted colored glass Christmas ornaments were a specialty of Czech glass factories from the late nineteenth century, and have since become a large industry, complete with famous-name designers. Lighting with candles or electric lights is commonly done, and a tree topper completes the ensemble. Strands of tinsel may be hung in groups from longer branches to simulate icicles. Baubles are another common decoration, and usually consist of a fairly small hollow glass or plastic sphere coated with a thin metallic layer to make them reflective, and then with a further coating of a thin pigmented polymer in order to provide color. Individuals' decorations vary wildly, typically being an eclectic mix of family traditions and personal tastes; even a small unattractive ornament, if passed down from a parent or grandparent, may come to carry considerable emotional value and be given pride of place on the tree. Conversely, trees decorated by professional designers for department stores and other institutions will usually have a "theme"; a set of predominant colors, multiple instances of each type of ornament, and larger decorations that may be more complicated to set up correctly. A full study of the passage shows that the people would cut down a tree and work it with a chisel to engrave an image in it. They would also carry it from place to place as an object to be feared and worshipped. The only consistencies with Christmas tree customs seem to be that both are made of wood and both are decorated. Some Christians, again a minority, feel that since Christmas trees are not biblically ordained, they should not be used. Such individuals and Christian denominations are unlikely to celebrate Christmas at all. In the United States, public Christmas trees set up by cities and other governmental bodies have been criticized as an instance of "establishment of religion" in violation of the First Amendment of the Constitution. They have been defended on the grounds that what is being celebrated is the traditional holiday of Christmas, not the Christian religion itself. In such situations they are sometimes called "holiday trees"; which in turn has offended some Christians and traditionalists. Hill, L. 1989 Christmas Trees Pownal, VT: Storey Communications. Nix, S. 2006. Top ten Christmas tree species sold in North America. 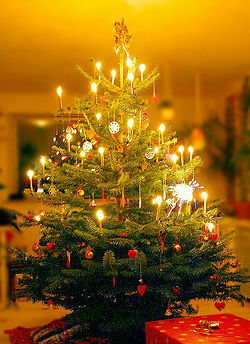 http://forestry.about.com/cs/christmastrees1/a/top10_xmastree.htm (accessed June 7, 2006). This page was last modified on 29 August 2008, at 13:33.